Individual stock selection prevails over macro opinions, be they about the economy or the markets. This approach generally has been vindicated in the past, as value investors tended to outperform a majority of money managers over full market cycles; and this outperformance has been achieved principally during bear markets, by losing less than most. The reason, I believe, is so obvious as to sound simplistic: When a stock is selling close to the “intrinsic” value of its underlying company’s shares, it does not have to travel down very much to find a floor. In spite of this “unquestionable” logic, the great majority of portfolios (including those of some iconic value investors) were engulfed in the panicky downward spiral that followed the Lehman Bros. failure, between the summer of 2008 and the final bottom, in early 2009. That part of the overall 53-percent decline from the 2007 top to the 2009 bottom was generally indiscriminate – more so than I can remember throughout my career, with the possible exception of the one-day crash of 1987; but that violent but brief market episode did not trigger a global financial crisis or recession. At this stage of a discussion, a broker would typically tell you, “This is not a stock market, but a market of stocks,” implying that there are always attractive investments somewhere, even when the overall market seems overpriced. And although this is a typical sales pitch, they usually are correct. This time, however, we may have to work harder to find those attractive investments. David Kostin, Goldman Sachs’ chief U.S. equity strategist, explained that investor demand for “value” has been so pervasive that low-valuation stocks had outperformed higher valuation peers by 12 percent in 2013. 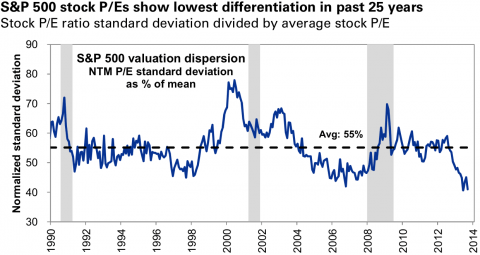 As a result, the distribution of S&P 500 P/E multiples was now its tightest in at least 25 years, implying less differentiation of companies based on valuation. If you’re having trouble finding undervalued stocks, this is some indication that it’s not just you. The current valuation spread is narrower than it was in 2007, and stands in stark contrast to the early 2000s when it was wider than usual. Read Tocqueville Funds’ Contrarian Investing in a Liquidity-Driven Environment. 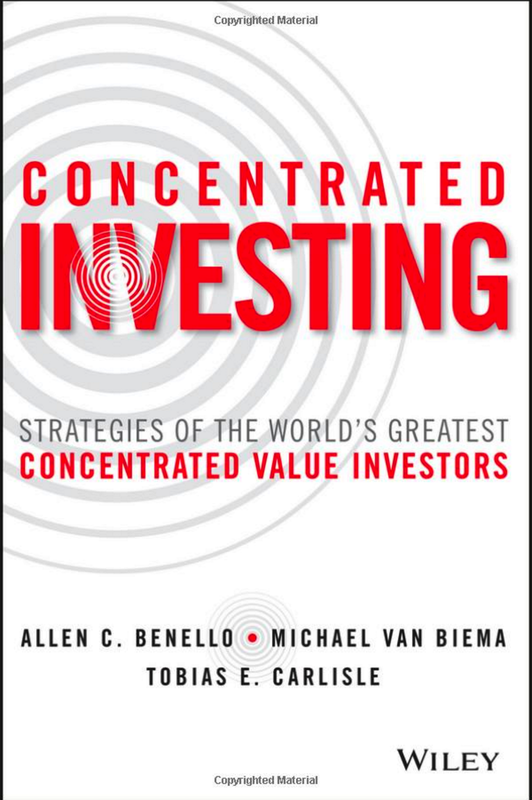 This fits together with James Montier’s latest white paper, “No Silver Bullets in Investing” (December 2013). 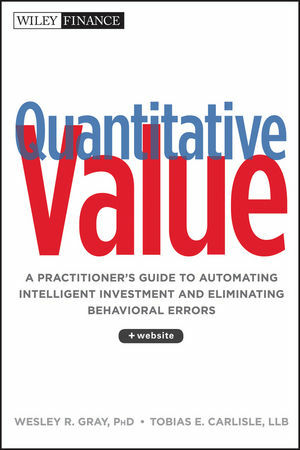 In it, he makes the case that stock selection strategies that have a “factor tilt” (such as “value”, “small cap”, “low volatility”, or “quality”) should only be favored at a given time if the factor is cheap at that time. He goes on to demonstrate this case with data that shows outperformance from a “quality” strategy following periods when “quality” was cheap relative to the market as a whole, and underperformance following periods when it was expensive. factors/styles (possibly could be done for sectors, etc. too. There’s a new Shiller CAPE ETF that does something like this) so that I could tilt my portfolio toward the factors/styles that offer the best relative valuation at any given time. I’d also like to see someone with access to the data run a long term backtest on this idea to see how well it has worked in the past. What do you think of this concept? Do you know where I could find some data/studies/information?